Tailored environ® skincare solutions | iiaa Ltd | The UK and Ireland distributor of Environ Skincare, jane iredale makeup and Advanced Nutrition Programme. Welcome to a NEW Environ® collection of tailored skincare boxes designed and created to address your clients’ skin concerns. This 2018 Limited Edition Skin Essentials Collection includes sophisticated ingredient combinations developed to care and improve your clients’ skin appearance and texture. SKIN CONCERN: AGEING WHAT HAPPENS? During the ageing process, skin loses collagen and elastin, prompting the appearance of fine lines/wrinkles. External factors such as free radicals, lifestyle and UV damage can further accelerate the ageing process with diet and hormonal changes being known contributors. 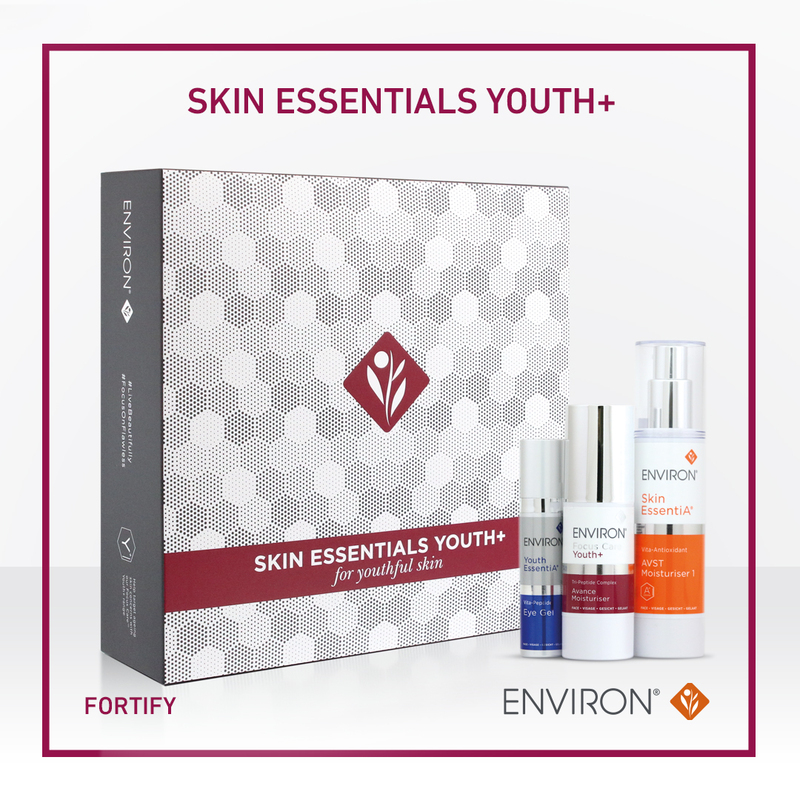 The Environ® Skin Essentials Youth+ Box targets signs of ageing with a combination of scientifically researched ingredients that aim to deliver youth-enhancing benefits. The Skin Essentials Youth+ Box contains: Skin EssentiA Vita-Antioxidant AVST Moisturiser (1-5) a combination of Vitamin A, C & E to stimulate collagen and elastin and protect the skin; Tri-Peptide Complex Avance Moisturiser a multifunctional cream containing a trilogy of peptide complexes that may assist in maintaining the skin's youthfulness with an age-defying boost; Vita-Peptide Eye Gel containing a combination of peptides and antioxidants to help improve the hydration, tone and elasticity of the skin. Dry skin is often caused by external stressessuch as the weather climate or harsh soaps and exfoliators /moisturisers that strip the skin of moisture. When skin can’t retain moisture and sebaceous glands become less active, skin begins to flake and fine cracks appear. The Environ® Skin Essentials Moisture+ Boxcontains a range of key products that may assist in delivering moisture boosting benefits to dehydrated skin, leaving it looking healthier and visibly hydrated. The Skin Essentials Moisture+ Box contains: Skin EssentiA Vita-Antioxidant AVST Moisturiser (1-5), combination of vitamin A, C & E and antioxidants to normalise and repair the skin; Hydrating Clay Masque, a multi-tasking masque containing pro-vitamin B5 and vitamin E to boost hydration; Vita-Antioxidant Hydrating Oil Capsules, these capsules deliver a concentrated burst of hydration for the skin, enriching it with vitamins and natural surface oils. SKIN CONCERN: SENSITIVE WHAT HAPPENS? Skin that is easily irritated may be identified as being sensitive. Whether caused by inflammation, damage to the skin barrier or a weakened immune system skin sensitivity should be treated with targeted products that will help calm and relieve the skin. The Environ® Skin Essentials Comfort+ Boxcontains various combinations of scientifically researched ingredients that may assist in delivering comfort-enhancing benefits to sensitive skin, leaving it feeling relieved and looking healthier. The Skin Essentials Comfort+ contains: Skin EssentiA Vita-Antioxidant AVST (1-5) combination of vitamin A, C & E and antioxidants to normalise and repair the skin, Skin EssentiA Mild Cleansing Lotion - gentle moisturising cleanser that gently lifts surface impurities while assisting in maintaining skin’s natural moisture balance; Vita-Enriched Colostrum Gel, an immune-boosting serum may help to protect sensitive skin from external and internal stressors resulting to soothed and restored skin.